If you’re from the Northeast, then you know great bagels. Now... I can hear the New Yorkers arguing about who has better bagels in my ears right now, and I’m sorry New York, but us Massholes know something about bagels too! Ever since I moved to Florida from a small suburb in Boston, I have been searching for Tampa’s best round pillows of baked dough. In my hometown of Newburyport, Mass., Abraham’s Bagels serves mouthwatering, fresh-out-of-the-oven bagels with a perfect crunch on the outside and soft bread in the center. During my four years in Tampa, I've driven across town trying to find the perfect bagel just like Abraham’s. Here's a list of some of my favorites! If you’re looking for that hometown, bagel shop feel, this is the perfect spot! The bakers wake up early every morning around 4 a.m. to place your little bundles of joy in the oven. They have just about every flavor you could think of: Sundried Tomato, Garlic, Salt, Blueberry, Onion, Everything, Poppy, Pumpernickel, Sesame, Cinnamon Raisin, Honey Wheat, Jalapeno, Pumpernickel Everything and much more! They are round and fluffy on the inside, with a crispy crust on the outside. Make sure you get there early because the line is always out the door! 18 Bagels Co., on the corner of S. Dale Mabry and W. Kennedy, has cornered the market on dessert bagels in Tampa. As a proud foodie, I watch videos from New York bakeries all the time and see the fancy dessert bagels they serve. 18 Bagels Co., named after the number in Judiasm for "chai" or luck, has both rainbow unicorn bagels and Oreo bagels with Oreo cream cheese. They also have build-your-own sandwiches, salads, and sides for those who don’t want a bagel or cream cheese... but honestly, what's wrong with those people? The best place for an early morning bagel is Clearwater Bagels. Like St. Pete Bagel Company, they open at the crack of dawn to serve freshly baked bagels. This place makes you feel like you're back in your favorite hometown coffee shop, with interesting flavors like Apricot and Chocolate Raspberry, and options including plain cream cheese or butter as toppings. Looking for great bagels near Downtown Tampa? Check out Farrell’s on the Island, a hometown coffee shop that's known for remembering both your order and your name. Bagels are made fresh every day and served until they're out of inventory. My favorite topping to put on my bagel is their bacon - it’s served right off the grill each morning! Do you even go to USF if you’ve never been to Bagels Plus during an intense hangover? We all know that nothing cures a hangover like a bagel, and this fixture of North Tampa has the USF students covered. Their fluffy bagels and whipped cream cheese are a "go-to" during those intense hangovers senior year. With 14 different spread options and a variety of flavors, you can try something new each time you visit. They even have sandwiches like their piled high roast beef, or their Smoked Salmon Nova that keeps their customers coming back for more. Would I drive 30 minutes for a bagel from New York Bagel & Bean in Carrollwood from where I live in Hyde Park? Yes I would. Absolutely! These are just like bagels I was looking for, and with the perfectly whipped cream cheese that I like. Look for both traditional bagels and bagel sandwiches for guests to enjoy. Try their everything bagel with lox - it seems to me like it’s a crowd favorite! Like most good bagel places, you can recognize Brandon Bagels by their neon bagel sign in the window. With their fresh, made-daily bagels, pastry muffins, and flavored cream cheese, this shop has won over the hearts of everyone in Brandon! The bagels are round and airy, yet have a crunchy crust on the outer shell. You have to arrive early however, because they only stay open until they run out, which is almost every day! Head to North Tampa for a "Big Apple" bagel that will satisfy your New York-bagel needs. They serve sandwiches that are the obsession of the good folks of Land O’ Lakes. Meat is piled high, and the bagels provide the perfect bookends to their hearty fillings. Some of their fan favorites are the Turkey & Havarti, Kick-N-Roast-Beef, and Chicken Caesar. Bagelicious & More are known for their round and fluffy bagels served alongside other crazy concoctions. 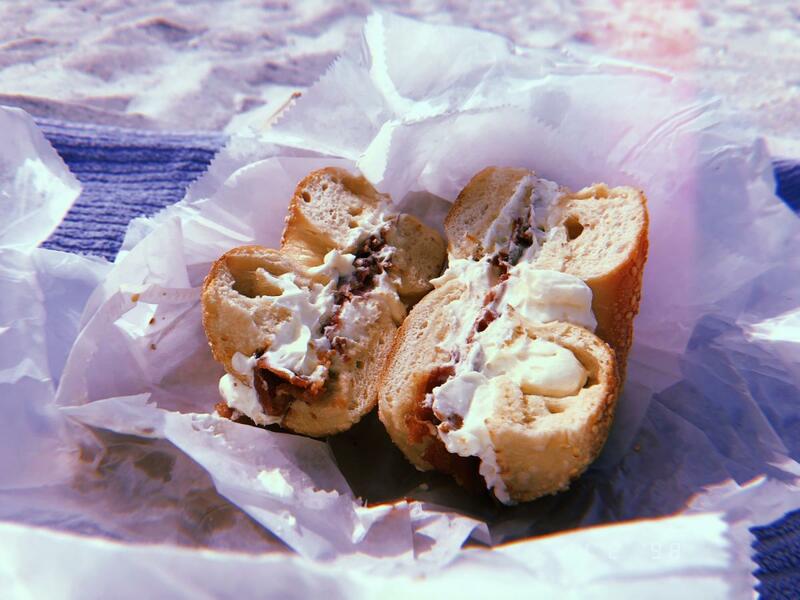 Unlike any other location on this list, Bagelicious & More isn’t known for their traditional bagels and cream cheese, but for pizza bagels served with red sauce, mozzarella cheese and your choice of toppings! They're a hit! And if you’re looking for more information on dining in Tampa check out 813area, your free and local guide to everything in the Bay!